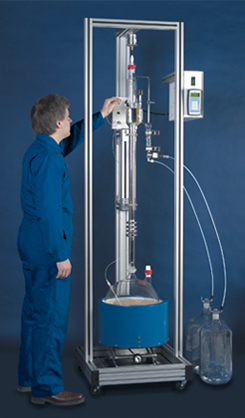 There are many more applications for solvent recyclers. These range from recycling common laboratory glassware cleaning solvents such as acetone to recycling Freon and Freon substitutes used to clean parts of the space shuttle. The scope is so large that all the applications cannot be detailed here. But if you have questions about recycling a specific solvent, please contact us. In general the bigger the difference in boiling point between a solvent and the contaminant the easier it is to recycle. It is also important to check to see if the solvent azeotropes with any of the contaminants. An azeotrope is an interaction between two chemicals that cause them to form a constant boiling mixture. Azeotropes can complicate the solvent recycling process and need to be taken into account when designing a solvent recycling program. Of course the end result of any solvent recycling program should be significant cost savings. The savings come from both a reduction in the purchase of new solvent and the reduction in disposal costs for the waste solvent. 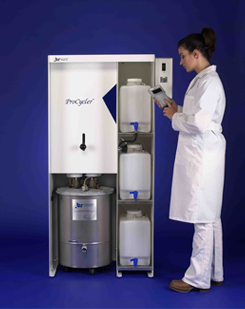 The solvent recycler should pay for itself in a reasonable period of time. Once it has paid for itself, the solvent recycler generates income for the owner with each batch that is processed. As a bonus, solvent recycling benefits the environment by putting solvent in a never ending cycle of use and reuse.